Start off your visit on the 4th (Sat): admire all the interesting features of Fenway Park. Keep things going the next day: make a trip to Louisburg Square, admire the natural beauty at Boston Public Garden, then don't miss a visit to Boston Public Library, and finally admire the masterpieces at Museum of Fine Arts. For photos, where to stay, ratings, and other tourist information, refer to the Boston trip itinerary tool . London, UK to Boston is an approximately 10.5-hour flight. Traveling from London to Boston, you'll gain 5 hours due to the time zone difference. Expect a daytime high around 15°C in April, and nighttime lows around 5°C. Finish your sightseeing early on the 6th (Mon) so you can travel to Blue Mountain Lake. Blue Mountain Lake is a rural hamlet in the Town of Indian Lake of Hamilton County, New York at the intersection of New York Routes 28 and 30. Kick off your visit on the 7th (Tue): appreciate the extensive heritage of Northville-Lake Placid Trail, then take in the awesome beauty at Blue Mountain, and then hike along Castle Rock Trail. For maps, photos, other places to visit, and more tourist information, refer to the Blue Mountain Lake travel itinerary planner . Drive from Boston to Blue Mountain Lake in 5 hours. Alternatively, you can fly. Traveling from Boston in April, things will get a bit cooler in Blue Mountain Lake: highs are around 11°C and lows about -4°C. Cap off your sightseeing on the 7th (Tue) early enough to travel to Toronto. Toronto is a city in Woodson County, Kansas, United States, along the Verdigris River. On the 8th (Wed), admire the majestic nature at Cross Timbers State Park. To see reviews, traveler tips, other places to visit, and more tourist information, read Toronto day trip website . The Route module can help you plan travel from Blue Mountain Lake to Toronto. The time zone changes from Eastern Standard Time to Central Standard Time, which is usually a -1 hour difference. Prepare for somewhat warmer weather when traveling from Blue Mountain Lake in April: high temperatures in Toronto hover around 23°C and lows are around 8°C. On the 8th (Wed), wrap the sightseeing up by early afternoon so you can travel to Washington DC. 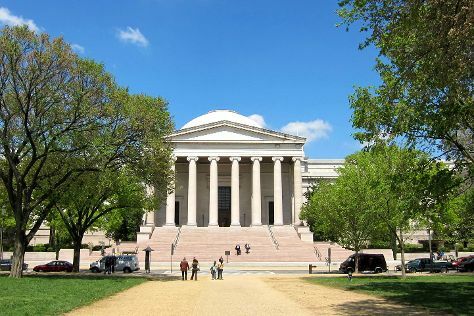 Washington DC is known for museums, historic sites, nightlife, zoos & aquariums, and parks. Your plan includes some of its best attractions: explore the world behind art at National Gallery of Art, learn more about the world around you at Smithsonian National Museum of Natural History, ponder the world of politics at United States Capitol, and get engrossed in the history at United States Holocaust Memorial Museum. To see ratings, maps, other places to visit, and other tourist information, you can read our Washington DC trip website . The Route module can help you plan travel from Toronto to Washington DC. The time zone changes from Central Standard Time to Eastern Standard Time, which is usually a 1 hour difference. April in Washington DC sees daily highs of 23°C and lows of 11°C at night. Finish your sightseeing early on the 11th (Sat) so you can travel to New York City. New York City is known for museums, nightlife, shopping, historic sites, and parks. Your plan includes some of its best attractions: take in the pleasant sights at Central Park, pause for some photo ops at Statue of Liberty National Monument, admire the landmark architecture of Empire State Building, and don't miss a visit to Times Square. To find traveler tips and other tourist information, go to the New York City holiday planner. You can fly from Washington DC to New York City in 3.5 hours. Other options are to take a train; or drive. When traveling from Washington DC in April, plan for little chillier days in New York City, with highs around 19°C, while nights are about the same with lows around 8°C. Finish your sightseeing early on the 17th (Fri) to allow enough time to travel back home.